In what might be one of the biggest consumer fraud/business litigation cases to date, in late December, Wells Fargo agreed to pay $575 million to resolve unfair/deceptive trade practices and state consumer protection claims, which includes a payment of approximately $28.3 million to Florida. The settlement is linked to Wells Fargo activities involving opening millions of unauthorized accounts, enrolling customers for banking services without their consent, providing their information to third parties such as life insurance companies, charging customers for loan services, and charging people a number of fees, amongst other misdeeds. Specifically, between 2005 and 2016, the bank reportedly opened more than 3.5 million unauthorized accounts and enrolled more than 500,000 customers in online transactions without their consent, providing these customers with insurance policies they never authorized. In addition to payments made to the state, Wells Fargo will also be refunding millions of dollars to auto loan and mortgage customers. To date, this settlement represents one of these most significant negotiations between a national bank and state attorneys. Wells Fargo has also agreed to implement a program which allows any customer who feels that they were affected by the bank’s conduct to have their case reviewed for potential misconduct and redress. Part of this “restitution review program” will involve providing refunds to customers who did not already receive compensation due from efforts that are already underway. Although the company has already reached settlements with the Consumer Financial Protection Bureau and Office of the Comptroller of the Currency, as well as a number of city and state attorney generals, it still faces probes by the Department of Justice, Department of Labor, and the U.S. Securities and Exchange Commission. Two years ago, the bank agreed to pay close to $200 million to settle federal claims out of a total of approximately $2 billion in overall fines. 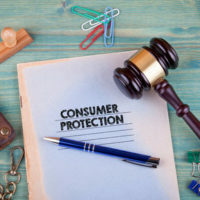 Florida’s Deceptive and Unfair Trade Practices Act provides consumers with private remedies, explicitly providing a private cause of action where the Federal Trade Commission Act does not. In order to trigger the law, a consumer must suffer an injury as part of commerce or trade activities, where recovery can also include attorney’s fees. Under the law, a “deceptive” practice has been defined through case law as one that is “likely to mislead” consumers and an unfair practice is one that is likely to “offend established public policy” and is immoral, oppressive, substantially injurious to consumers, unethical, and/or unscrupulous. Florida and federal law protects consumers from certain unsavory business practices. This includes your right to take companies like Wells Fargo to court if you feel that you have been the victim of these practices. Contact our top-rated consumer fraud attorneys at Moran, Sanchy & Associates today to find out how we can best protect your financial interests. We serve clients throughout Southwest Florida.